The good part of the story is, the movie was successful in crossing 50 crores overseas collections. The movie had a 7-day total of 71.50 cr nett which means it was the most successful film of 2016 but failed to break records. Overseas it earned 2.7 million $ (17.93 cr) on opening day and enormous 6.01 million $ (40.01 cr) over the first weekend followed by 7.73 million $ (51.48 cr) total figure during the first week. With the incredible performance of the overseas market, it could be concluded that the success rate was much better for brand SRK outside the India. In the home country, the movie was released in an around 3500 screens including every state. While overseas it was released in around 1100 screens (Mainly in Dubai, USA, and European countries). Total collections from 1100 screens were around 51 crores and from 3500 screens was only 71 crores. 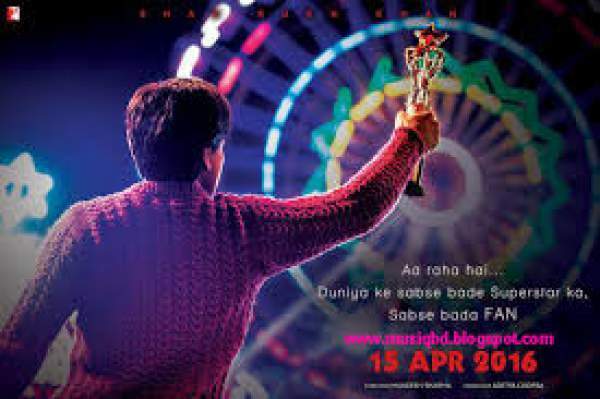 On Friday the movie had performed like earlier days, according to the initial reports, FAN had collected over five crores on 22nd April. The report will be finalized by tomorrow. For now, the WorldWide collection comes to 122.98 crore rupees. It may be a chance that you will find 150 crore rupees collections on some websites, 150 crores is the gross value of FAN Collections. Although for analysing the actual position gross value which doesn’t include different type of expenses like Tax etc should be ignored. The trends were yet unexpected and shocked every trade analyst. The Jungle Book is doing a great business in India despite being a Hollywood production and Fan is doing great business in the United States being a Bollywood production. The occupancy for FAN Movie was dropped a huge in previous days. The opening occupancy was 45% which was fallen to 20% or less in the second week. An important factor of not having scheduled release of any other big Bollywood movie had saved FAN a more week to perform at the box office. Overall the occupancy trends were observed by the holidays, on the leaves, the film played better. As a conclusion, we can say that FAN Collections showed well on the weekends and the worst on weekdays. Although this film amounts to be a big disappointment for Shah Rukh Khan since after Happy New Year to Dilwale, his performance is regularly depleting on the box office. Fans of SRK have the last hope with Raees. Haahaaaaa….what a joke…din bhar gaye hai tumhaare pakistani srk ke. He is an Indian and he is very patriotic towards his nation INDIA…srk is the king of Bollywood and remember he loves India verryyy verryyy much because India is his motherland…..
Theriii is nothing before fan…..
175CR paar karchuki hai, ab bhokne se kya fayada…. Kisne ,kisne bataya? Media me koi yaar hai tera…. media nehi kah ke srk ne sabhi bollywood actors ki ‘G’ faax di bai..
Jitna akshy, randveer,ajayki filmone kuch nahi ukhade bechare ghareeb! Bade bade shehro me Chote mote darector Ki story flop hojati hai dosto per ?????? Tumhara jess fan is bakwas tumhari shakel bakwas tumhari nasal bakwas ek film kya low hogai tum comment dete din pure ho gaey tumhare jese nakhli tuchche fano ne apni okat dikha di took tu !??!?!!??!??!?? This film will defenately cross 250 crores in india + worldwide. I am your biggest fan…. Only coz of Srk I watch indian movies. If Srk will go to take retirement,then i will ignore bloody indian movies. he is the only UNESCO prize winner from the INDIA for his charitable works. Aur is baat se India ka naam badhta hai. In the end bas ek line for haters…. For those who call srk as pakistani ….. have they got proof that they are true INDIAN and if yes then what have they done for India in india.. apart from eating nd excreting here… Think for a while before replying. ? Award to yaar bika hua hota h, award ki koi value nhi h, jiski film chalti h wahi superstar kahlata h.